Game Preview: Barrie Colts @ Hamilton Bulldogs. #OHL - Very Barrie Colts | A website covering the Barrie Colts of the OHL. Tonight, the Barrie Colts take on the Hamilton Bulldogs at the FirstOntario Centre for the second of four meetings this regular season. Colts VS Bulldogs this season. November, 24th of 2016 was the first and only other meeting between these teams this season. We think that it is fairly safe to say that the Colts were not very gracious guests. Especially ion the 1st period. The game started with Niki Petti getting the first shot of the game but after that, the next 10 minutes would be all Ponies. The Colts got the next six shots and the sixth one would get them on the board. Jason Willms scored to give the Colts a 1-0 lead. 45 seconds later, Lucas Chiodo got a shot and he scored giving the Colts a 2-0 lead. A few minutes later, Anthony Stefano would score to put the Colts up 3-0. It is worth noting that Hamilton still hadn’t generated a second shot on goal, and the Dogs pulled Ceci and replaced their goal with Kaden Fulcher. Shortly after the goalie change for Hamilton, they took a major boarding penalty. Marian Studenic got the 5-minute penalty and a game misconduct. Barrie would score 3 quick power play goals. Matt Brassard and Ben Hawerchuk scored the first two, while Justin Murray would follow up with his first goal of the season. Colts would go up 6-0. Not long later, Michael Cramarossa would score a short-handed goal to cut into the Colts lead. Barrie was still up 6-1. Barrie left the 1st period with a 6-1 lead. They scored 3 goals on the power play while out-shooting Hamilton 20-5. 2nd period with Hamilton making a goalie change. The next two periods were all Bulldogs. Trent Fox, Matthew Strome and Adam Laishram would score in the 2nd to shorten the Colts lead to 6-4. Barrie generated some chances but Hamilton had the edge. Bulldogs out-shot the Colts 12-10 in the period. 3rd period was another period the Bulldogs applied good pressure. Michael Cramarossa would score quickly to make it only 6-5 for Barrie. The goal was his second of the night. Hamilton would generate 9 more shots over the period but David Ovsjannikov was able to stop them all to give the Colts the 6-5 win. Kade Landry had a great night for the Ponies getting 3 assists. David Ovsjannikov finished the night with 23 saves. The team went 3 for 9 on the power play and killed off their only penalty. Hamilton has been good recently. They have won a couple games over the Oshawa Generals and have won 6 of their last 10 games. They currently sit in 3rd place in the East Division, though it is worth mentioning that they are tied with the Kingston Frontenacs. Both teams have the same total games played. Despite recent success, Hamilton was unable to beat the 67’s last night. Early in the 2nd period, they had a 2-1 lead. Luke Kutkevicius would score first giving him his 5th goal of the season. Ottawa would tie the game but early in the 2nd period Brandon Saigeon would score his 8th of the season to give the Dogs the 2-1 lead. That would be it for Bulldogs production. Ottawa scored a couple more goals in the period to give them the lead and another in the 3rd for good measure to give them the 5-2 win. Hamilton managed to get 26 shots on goal but not being able to score on 4 power plays was a factor. An area the team would look to improve after this game is in the face-off circle. The team only won 14 draws in the game. Patrick White of the 67’s won 9 on his own. Not a bad team game but this was not a game they would have wanted to lose. I would look for them to come into Barrie looking to get back into the win’s category desperately, and tie the season series. Ponies drop Spirit in OT. Barrie is coming off a hard fought 5-4 overtime win last night over the Saginaw Spirit. Hayden Hodgson scored first for the Spirit to give them a 1-0 lead but Barrie would strike back with 3 goals in the period. Magwood scored his 10th of the season to tie the game and BIG Curtis Douglas would get his first career OHL goal less than a minute later to put the good guys up 2-1. 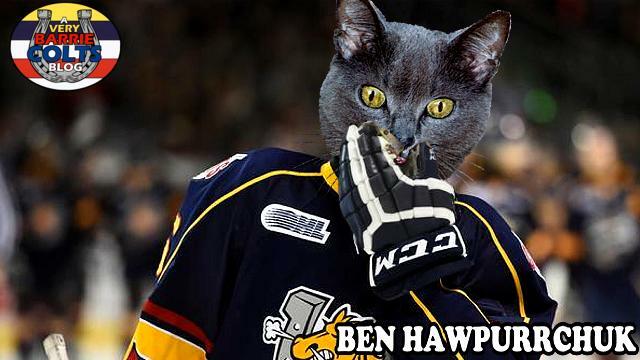 Before the period would end Ben Hawerchuk would score to give the Colts the 3-1 lead. Brady Gilmour would cut into the Colts lead early in the 2nd on the man advantage making it 3-2. The Spirit came out hard, at one point putting up 9 shots in about 2 minutes. 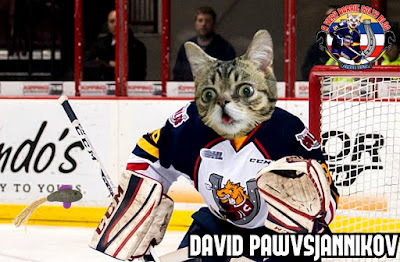 David Ovsjannikov made some big saves. The 2nd period would end with the Colts holding on to a 3-2 lead. Saginaw had the edge in shots 22-16 through two periods. Madwood scored his second goal of the night 3:21 into the period to give the Colts a two goal lead again. The rest of the period was all Spirit and they would end up tying the game up late 4-4 on Hayden Hodgson’s 2nd goal of the night. We would need OT. OT only lasted 1:28 when Ben Hawerchuk scored his 2nd of the night to give the Colts the 5-4 win. The goal was his 7th on the season. Ovsjannikov made 27 saves on the night. Barrie was unable to score on 3 man advantages and allowed 1 goal on 4 penalty kills. Barrie was out-shot 31-24. Barrie has earned points in their last 2 games will look to extend that to 3 games. They will face a team who will come into tonight thinking they are the better team and hungry for a win following a loss. Barrie will need to be strong on the man advantage when they get chances. Nizhnikov and Radke looked good at times and I would look for them to generate more chemistry together. I would guess Christian Propp will get the start, which means anybody else will. puck drop is scheduled for 7:30 tonight.